The struggle of women varies from one cultural context to the next and it’s often difficult for those outside to effectively assist their sisters in other parts of the world. It can be challenging to put together a culturally sensitive campaign that helps, rather than hinders the progress of women living in a different context to ourselves. As women in the Western world, we’re mostly free from the day-to-day burdens that war and famine inflict upon communities. This means that we have both the time and the privilege to actively contribute to making the world a better place for communities outside of our own. But it can be hard to know where to start. So I caught up with Holly Miller from ActionAid Australia to see how we can make a meaningful contribution to bettering the lives of those less fortunate. ‘ActionAid is a global organization that works in over 45 countries around the world and we put women at the centre of everything that we do,’ Holly says. As a grassroots organization, ActionAid works with women around the globe to address their needs as identified through consultation with those on the ground. This means that the issues that ActionAid responds to are ones that have been named as important by those living in disadvantaged communities worldwide. ActionAid recognizes the vital role that women play within their communities and acknowledges that the empowerment of women is central to reclaiming their rights. Therefore ActionAid branches work with their local NGOs to identify problem areas and implement solutions, meaning that the approach has the support of those for whom it has the greatest affect, women on the ground. 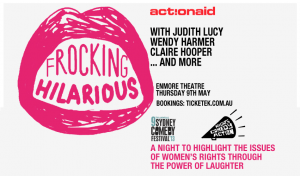 This year ActionAid has teamed up with the Sydney Comedy Festival and recruited a number of star comedians including Judith Lucy, Wendy Harmer, Claire Hooper and Gina Yashere to launch the hilarious Rights! Comedy! Action! Campaign. Holly explains, ‘We’re really excited to be working on this campaign with the Sydney Comedy Festival. There’s a desire amongst Australians to engage with what’s happening internationally and we think this event offers the perfect space to be able to do that’. The campaign aims to bring Australian women together in a comfortable space to raise awareness of the plight of women overseas. ‘Laughter is something we recognize as being a solidarity building force, in that if you laugh with a friend or if you laugh with someone who previously wasn’t a friend it creates those bonds and it solidifies friendships. ‘It’s also universal, regardless of culture or language or age or gender, laughter cuts across all of that and is something that people can do together and that everybody everywhere understands. ‘It’s also contagious. So if there are people around you who are laughing you tend to laugh too and social movements can be a bit like that. Laughter gathers momentum in a way that social movements do. Rights! Comedy! Action! Will raise money for the work of ActionAid and fund projects run by ActionAid offices overseas in collaboration with ActionAid Australia. Perhaps more importantly, it will contribute to raising awareness of women’s rights overseas and start a dialogue about these issues. Enmore Theatre (Sydney) will host the star-studded line up on Thursday May 9th. Tickets are $39 or $34 for groups of 8 or more and can be purchased through Ticketek or ActionAid. If you’re unable to make the event but would like to donate visit the ActionAid website for more information on how to make a donation and how to make a change. This entry was posted in Arts, Get Involved and tagged action aid, aid, comedy, event, feminism, laughter, rights, womens rights. Bookmark the permalink.